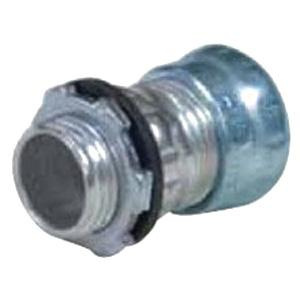 Topaz Electric Insulated throat compression connector of trade size 3/4-Inch, is perfect for use with EMT conduit. This concrete-/rain-tight connector features steel construction and zinc-plated finish. It measures 1.375-Inch Dia x 1.187-Inch. It has thread of length 0.5-Inch. Connector is UL/cULus listed, CSA certified and meets NEMA/ANSI standards. * Inventory displayed is accurate as of 04/21/2019 22:40 PDT.